Benedict Cumberbatch plays the title character in the Showtime miniseries Patrick Melrose, which begins on Saturday. Benedict Cumberbatch, the deep-voiced, strikingly handsome actor whose roles have ranged from Sherlock Holmes to Doctor Strange, once said there were only two roles on his long-standing acting "bucket list." One was Hamlet, a role he played in 2015. The other? Patrick Melrose, a role he tackles — and conquers — in a new Showtime miniseries beginning Saturday. Parts of it are wickedly funny; other parts are searingly dramatic. But all of it is riveting, and excellent. The first novel featuring Patrick Melrose — a privileged British aristocrat with a past that haunts him, and a drug addiction that nearly kills him — was published in 1991. Like the others in the series, it was written by Edward St. Aubyn as a mostly autobiographical exercise in exhuming and confronting both his demons and his childhood. St. Aubyn's mother was a wealthy American who gave his British father not only money, but power. The abuses of that power, directed at both young Patrick and his mother, are particularly cruel and severe — and are unveiled slowly in this TV production of Patrick Melrose. The first two episodes cover the events of the first two books, but not in sequence. One story line reveals the horrid abuse the father inflicts upon his 5-year-old son. The other shows Patrick, in his 20s and fighting the riptide of an addiction to heroin, learning that his father has died, and flying to New York City to retrieve his father's ashes. 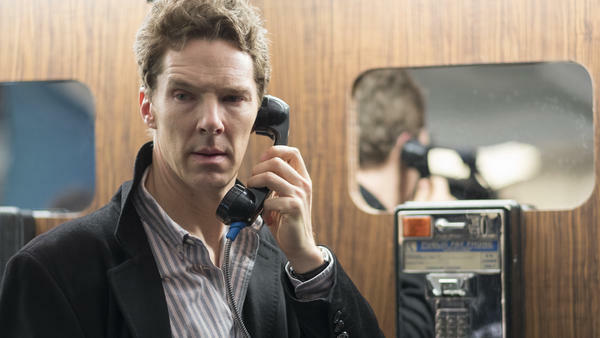 Two questions are central to this Patrick Melrose miniseries. The first: Can Patrick climb out of the drug-fueled, bitterly hostile spiral he's in? The other is: What put him there? For the second question, we spend a lot of time watching Patrick's childhood, where Sebastian Maltz plays young Patrick, Jennifer Jason Leigh plays his mother — and Hugo Weaving, in a role that's frightening in its dispassionate depravity, plays his father. The scenes from the past are so intense, even at what should be casual dinner parties and outdoor gatherings underneath fig trees, that you don't even notice, much less resent, that Cumberbatch is offscreen for large chunks of time. And when he's there, the actor is so good at embodying and reflecting all of Patrick's tightly coiled pains and emotions, he takes us with him every perilous step of the way. Other co-stars include Blythe Danner, Allison Williams and Holliday Grainger, all of whom contribute to a miniseries that might be described as Brideshead Revisited meets Trainspotting. David Nicholls, who adapted this story for television, and Edward Berger, who directs all five episodes, are both clearly on the same wavelength as the star of this show. The title character's story is unforgettably gripping, and so is the experience of watching this miniseries. One of Patrick's father's sayings, quoted often during the drama, is, "Go with the best, or go without." Watching Showtime's Patrick Melrose is going with the best. This is FRESH AIR. On Saturday, the Showtime cable network presents the first episode of a new miniseries called "Patrick Melrose" starring Benedict Cumberbatch in the title role. He plays a drug-addicted member of the British upper class in a five-part drama based on the semi-autobiographical novels by Edward St Aubyn. Our TV critic, David Bianculli, has this review. DAVID BIANCULLI, BYLINE: Benedict Cumberbatch, the deep-voiced, strikingly handsome actor whose roles have ranged from Sherlock Holmes to Doctor Strange, once said there were only two roles on his long-standing acting bucket list. One was Hamlet, a role he played at England's National Theatre in 2015; the other - Patrick Melrose, a role he tackles and conquers in a new Showtime miniseries beginning Saturday. Parts of it are wickedly funny. Other parts are searingly dramatic. But all of it is riveting and excellent. The first novel featuring Patrick Melrose, a privileged British aristocrat with a past that haunts him and a drug addiction that nearly kills him, was published in 1991. Like the others in the series, it was written by Edward St Aubyn as a mostly autobiographical exercise in exhuming and confronting both his demons and his childhood. His mother was a wealthy American who gave his British father not only money but power. The abuses of that power, directed at both young Patrick and his mother, are particularly cruel and severe and are unveiled slowly in this TV production of "Patrick Melrose." The first two episodes cover the events of the first two books but not in sequence. One storyline reveals the horrid abuse the father inflicts upon his 5-year-old son. The other shows Patrick in his 20s and fighting the riptide of an addiction to heroin, learning that his father has died and flying to New York City to retrieve his father's ashes. While there, after a particularly emotional and destructive stay at an elegant hotel, Patrick phones overseas to check in with a friend. BENEDICT CUMBERBATCH: (As Patrick Melrose) Johnny, Johnny, can you hear me? PRASANNA PUWANARAJAH: (As Johnny Hall) Patrick, how are you? CUMBERBATCH: (As Patrick Melrose) Oh, fine. I tried to kill myself last night. PUWANARAJAH: (As Johnny Hall) My God. Where are you calling from? CUMBERBATCH: (As Patrick Melrose) The bottom. PUWANARAJAH: (As Johnny Hall) Christ, are you all right? Patrick, tell me when you land. I'll come and meet you. CUMBERBATCH: (As Patrick Melrose) Look, I haven't got long. Can you hear me? PUWANARAJAH: (As Johnny Hall) Yes. CUMBERBATCH: (As Patrick Melrose) I've decided I'm going to take control of my life. I'm going to get clean. Hello, Johnny, can you hear me? PUWANARAJAH: (As Johnny Hall) Yes, I can. That's wonderful, but are you sure this time? CUMBERBATCH: (As Patrick Melrose) Of course. People always make such a fuss about these things. PUWANARAJAH: (As Johnny Hall) So what do you want to do? Patrick? Patrick, what are you going to do instead? BIANCULLI: That turns out to be one of the two central questions in this "Patrick Melrose" miniseries. Can Patrick climb out of the drug-fueled, bitterly hostile spiral he's in? And the other question is, what put him there? For that, we spend a lot of time watching Patrick's childhood, where Sebastian Maltz plays young Patrick, Jennifer Jason Leigh plays his mother, and Hugo Weaving, in a role that's frightening in its dispassionate depravity, plays his father. In this scene from Episode 2, in a gorgeous summer home in the south of France, young Patrick finds himself summoned to his father's bedroom. HUGO WEAVING: (As David Melrose) Do you know who King Shaka was? SEBASTIAN MALTZ: (As Patrick Melrose) No. WEAVING: (As David Melrose) King Shaka was a great and mighty Zulu warrior who made his troops stamp thorn bushes into the ground and march for days across hot, jagged rocks. The soles of their feet were slashed and burnt. And though there was resentment and pain at the time, the calluses this created meant that eventually, nothing would harm them. They would feel no pain. And what had felt like cruelty at the time was actually a gift. It was actually love. WEAVING: (As David Melrose) I don't expect you to thank me now, but I hope perhaps when you're older, you'll be grateful for the skill of detachment that I've instilled. BIANCULLI: Whatever punishment you imagine young Patrick is about to endure, it's probably worse. The scenes from the past are so intense, even at what should be casual dinner parties and outdoor gatherings underneath fig trees, that you don't even notice, much less resent, that Benedict Cumberbatch is off screen for large chunks of time. And when he's there, the actor is so good at embodying and reflecting all of Patrick's tightly coiled pains and emotions, he takes us with him every perilous step of the way. Other co-stars include Blythe Danner, Allison Williams and Holliday Grainger, all of whom contribute to a miniseries that might be described as "Brideshead Revisited" meets "Trainspotting." David Nicholls adapted this story for television. Edward Berger directs all five episodes. And they're both clearly on the same wavelength as the star of this show. The title character's story is unforgettably gripping, and so is the experience of watching this miniseries. One of Patrick's father's sayings, quoted often during the drama, is, go with the best or go without. Watching Showtime's "Patrick Melrose" is going with the best. GROSS: David Bianculli is editor of the website TV Worth Watching. He reviewed the new Showtime miniseries "Patrick Melrose," starring Benedict Cumberbatch. GROSS: If you'd like to catch up on FRESH AIR interviews you missed, like this week's interviews with filmmakers, actors and brothers Mark and Jay Duplass, and chef Lidia Bastianich, check out our podcast. You'll find lots of our interviews. GROSS: FRESH AIR's executive producer is Danny Miller. Our senior producer today is your Roberta Shorrock. Our interviews and reviews are produced and edited by Amy Salit, Phyllis Myers, Sam Briger, Lauren Krenzel, Heidi Saman, Therese Madden, Mooj Zadie and Seth Kelley. Thea Chaloner directed today show. I'm Terry Gross. (SOUNDBITE OF JUAN ANDRES OSPINA BIG BAND'S "102 FAHRENHEIT") Transcript provided by NPR, Copyright NPR.